Tens of thousands of people in Yemen have called for President Ali Abdullah Saleh to face trial for the deaths of hundreds of anti-government protesters. After nearly a year of protests, Mr Saleh handed over presidential powers to his deputy last month and agreed to leave office in February 2012. The deal also granted Mr Saleh, who remains honorary president, immunity from prosecution. He has asked the US for permission to travel there. US officials said Mr Saleh would only be admitted "for legitimate medical treatment" and that the request was being considered. Mr Saleh was badly injured in an attack in June after which he spent several months in Saudi Arabia for medical treatment. He said last weekend that he would leave for the US "in the coming days... to get out of sight... to calm the atmosphere for the unity government to hold the presidential election" in February. But he has also said he would return later as "an opposition figure". The anti-Saleh protesters are concerned that the president's inner circle, including his son, will attempt to hold on to power. Mr Saleh has ruled Yemen for more than 30 years. He has co-operated with the US in fighting al-Qaeda militants based in the country but came under increasing pressure from street protests from early 2011 to step down. Yemen also faces separatists in the south, Shia rebels in the north, chronic unemployment and corruption and dwindling oil reserves. 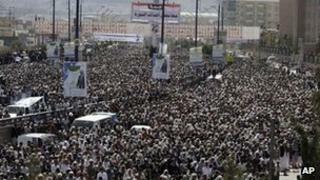 What next for Yemen after Saleh?